Paper quilling is one of the easiest and least expensive crafts for beginners. The rolling itself may take some practice, the basic tools are incredibly accessible and some are probably already in your home. 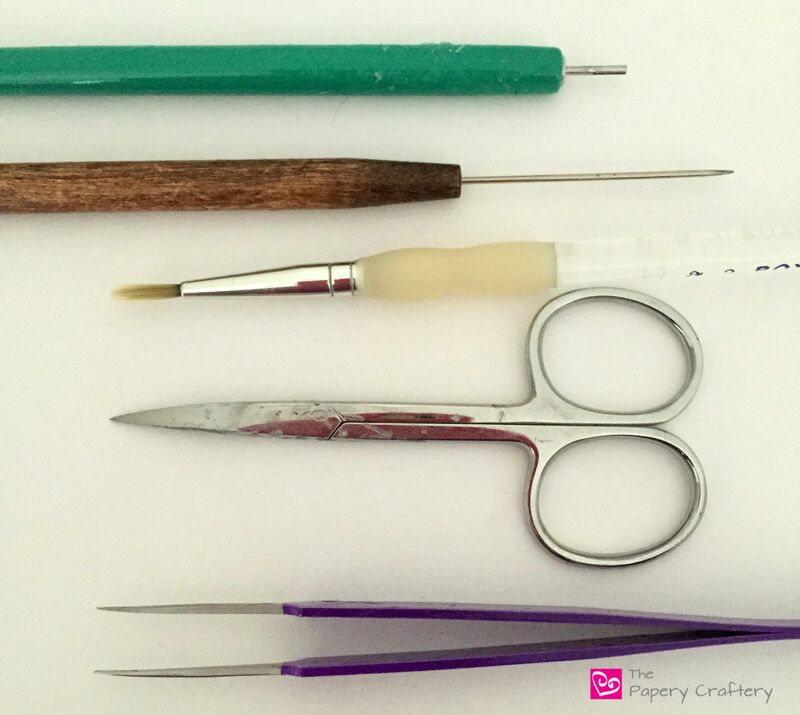 I’ve made a list of my most used quilling tools to help any quilling beginner get started. 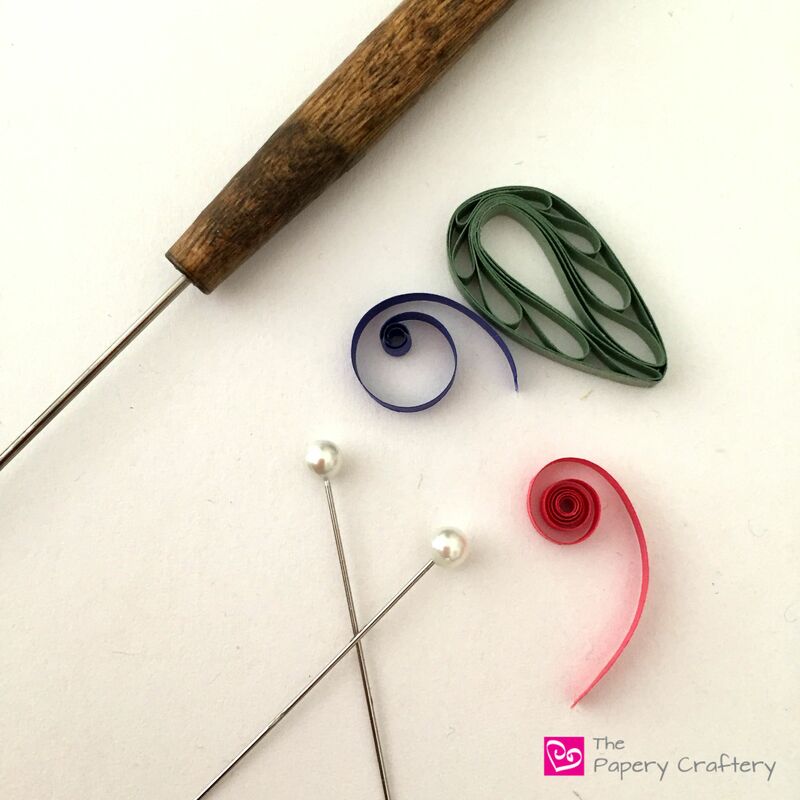 While there are 2 main types of quilling tools, I am a big fan of the needle quilling tool. I know a lot of instructors will recommend the slotted tool for beginners, but I’ve just never really got attached to one. The slotted tool might hold the paper easier, but I don’t care for the little bend it leaves in the center of each coil. I held out on buying a pair of tweezers dedicated to quilling and paper craft for a long, long time. And when I finally got one, I realized it was the one of the most important pieces of equipment that I had. My tweezers have made some jobs, like making my flower bud gift tags, go soooo much quicker. I don’t know how I went so long without tweezers. You don’t really use scissors too much in quilling, because torn ends of quilling paper leave a smoother result. But there may be times when you need to snip some paper. The thinnest pair of scissors will be your best bet. I stole my scissors from my Nana’s sewing kit over 25 years ago and they work perfectly. Amazon sells a handy little quilling tool kit that features both a slotted and needle quilling tool, tweezers and some small scissors. That could be a good option for the beginning quiller to decide which type of quilling tool works best for them. One of my favorite things about working with quilling paper is that you can really practice the craft anywhere! That being said, it’s always wonderful to have your own designated work space. I use this drafting table for my quilling. I love the extra storage underneath the desk, and the space on the side to hold some of my favorite tools. Wiping off extra glue dots and splotches leaves a more professional, finished look to your quilling work. To do this, I swiped one of my watercolor brushes with the smallest set of bristles I could find. It gets in between all my coils and lines and really cleans everything up. I use regular, old, extra strength white glue. Since I use the tiniest drops that I can and brush off as much excess as I can, I don’t worry too much about seeing any extra glue bits. Here is where I get particular. I have tried a few different bottles for my glue and this bottle is by far my favorite! Be sure to follow the directions about storing the bottle upside-down to prevent clogs; it really makes a huge difference! Over time, I have gathered a few different packs of straight pins that I use regularly to hold my quilling strips in place. Longer pins are the most useful, since they can stand further away from the quilling that you’re working on and don’t hit each other get in the way or damage your work as much. Cork boards are the basis of what you build your quilling on. Corrugated cardboard will do in a pinch, but the cork will last and last through years of pin pricks. Denser, heavier cork works the best. You can find cork boards made specifically for quilling that have a plastic template on the reverse side to use as a shape guide for your coils. Tracing paper is ideal for the sketches of your quilling designs. 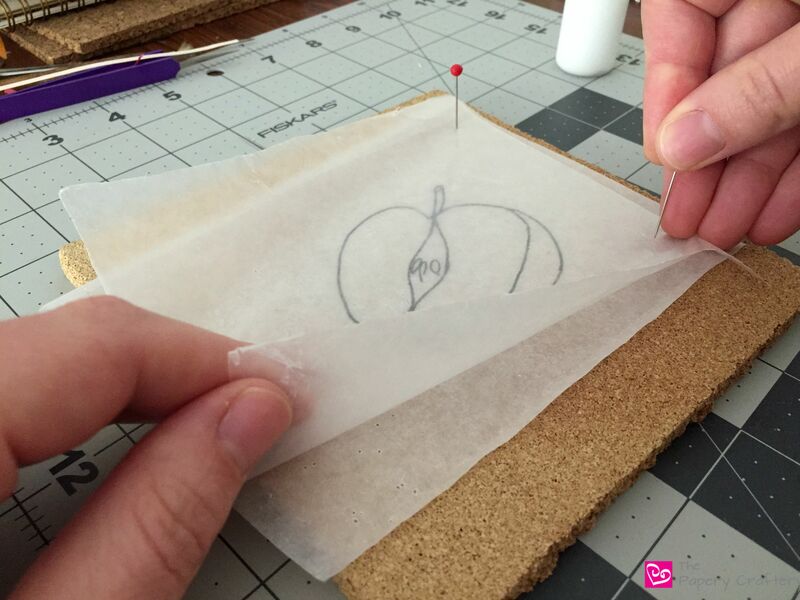 Since glue doesn’t stick to wax paper, use a small sheet over the sketch of your design and work over that. Use some straight pins to keep the paper on your cork board, like I did in the photo below. When you’re happy with your finished product, simply peel it off the wax paper. Of course I have to mention quilling paper! Quilling paper is now available in every shade under the sun and a few widths as well. I use the standard 1/8″ width, but many other modern quillers prefer the wider sizes. Some even cut their own strips! I have to admit that I just got on board with the quilling comb train. I don’t use it in many of my designs, but I’ve found some amazing uses for the comb to make flowers and leaves. I’ve been using a plastic hair pick as my comb, but I plan to get an actual quilling comb soon. 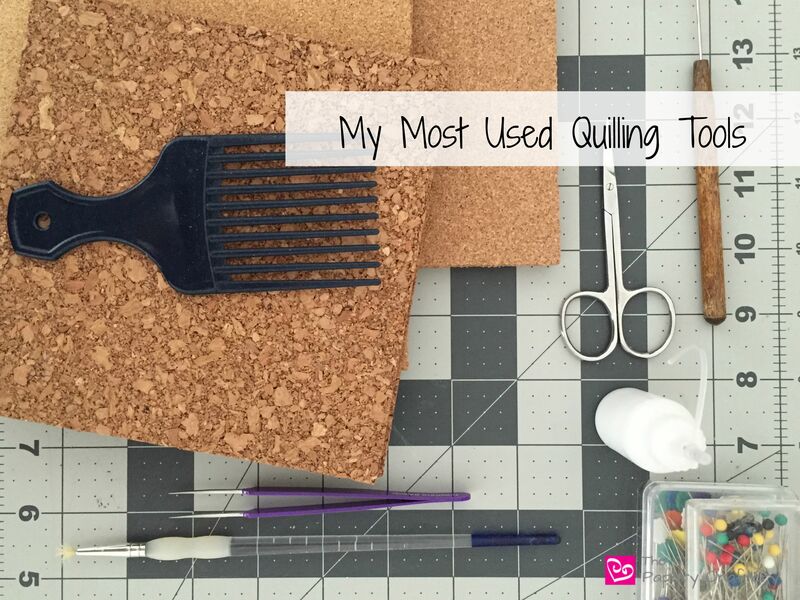 Update: I have fully embraced the quilling comb since writing this post. It’s a pretty handy tool, and I’ve featured it in a few tutorials, such as my paper mums and quilled shamrock! I mount my finished quillings on mat board. But one of the funnest parts about quilling is that you can use it to embellish cards, frames, jewelry or anything really. Use your creativity to its fullest! I’d love to hear what other tools you use for your quilled creations! Leave a comment below and tell me all about it! I’m sure your Nana is pleased that her scissors can contribute to such beautiful work. I quilled one project when I was young. My grandmother bought the kit for me. That’s the only one I ever did. I love quilling and I’m happy to have found you here. I have seen many beautiful designs and I want to get back into it. You know, jumping in with both feet. I’m looking at your blog here to make sure I get this right the first time. What I haven’t seen very much of is pattern books or individual patterns themselves. Is it only following a simple sketch nowadays? I’m not sure. Welcome back to quilling, Heather! I’m so glad you’re going to give it a try again! I’m not 100% sure what you mean by pattern books, but there are kits for projects sold online. Try QuillingSuperstore.com. I’ve seen them there, although I’ve never used them. I am offering a quilling class to a homeschool co-op and I am so thankful for all your tips and tricks. I plan to come here for all my planning help and project inspiration. That’s great! Let me know how your class works out, Janelle! How thick of cork board do you suggest? Thanks. Hi Hannah, great question! I’ve had a few cork boards that were too thin and wobbly. I’ve found the boards I use the most are at least 1/2” thick and very dense cork. The most important thing is that the boards don’t bend at all.